Total Dadagiri Movie All Songs Lyrics: Total Dadagiri is a most anticipated romantic comedy movie directed by Pathikrit Basu Produced by Shree Venkatesh Films Presented by Shrikant Mohta. News about Total Dadagiri Bengali Movie All Songs Lyrics Lyrics: Great news for all "Yash Dasgupta" lovers, He is come New Year 2018 with his 3rd Movie Total Dada giri. 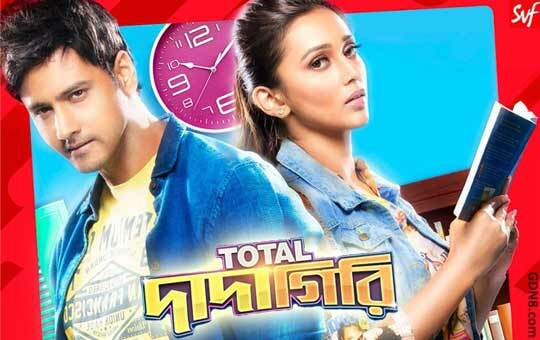 The lover boy Yash Dasgupta And sweet cute also gorgeous Mimi Chakraborty is the starring Main Lead Role In This Movie. This is a Triangle love story 3rd Lead role is Sourav Chakraborty acting police inspector and Pradip Dhar acting Villain In this movie. This is a Yash and Mimi 2nd Movie, 1st Movie Name Is Gangster. Trailer was so romantic and it will give complete idea's about the movie also story.